Dominic Valentine says faith and family are helping her heal and stay positive. Every morning at 4:15, Dominic Valentine, began preparing for the boot camp classes she ran out of her garage. Afterward, the personal trainer would follow up with a walk of several miles. It was during one of those walks near her Eastvale home last January that Valentine, 48, suffered a seizure. She and her husband spent the weekend seeking answers at nearby Corona Regional Medical Center, whose doctors ultimately referred her to Dr. Jack Lin, medical director of the UCI Health Comprehensive Epilepsy Program. Lin surmised that Valentine’s seizures were likely coming from her frontal lobe, the region of the brain that controls movement, among other vital functions. An MRI revealed the presence of an anaplastic oligodendroglioma, a type of malignant brain tumor that is often discovered because of the onset of seizure activity. Lin consulted with his UCI Health colleagues, neurosurgeon Dr. Sumeet Vadera and neuro-oncologist Dr. Jose Carrillo with the Comprehensive Brain Tumor Program. The team agreed that along with removing the tumor, they also would try to ensure that Valentine could live seizure-free. "Few centers have the expertise and the willingness to take the extra step to treat seizures and brain tumors all at once,” said Vadera, who specializes in surgical treatments for epilepsy, brain and spinal tumors. Armed with that detail, he successfully removed the tumor and the area triggering the seizures from the frontal lobe, specifically in a region that controls motor functions, as Lin had initially suspected. When Valentine woke up, she had no mobility on her right side. Although her medical team had told her that she would likely have some temporary weakness after the surgery, to mentally prepare her, the reality was hard to deal with. As her movements improved after days in the hospital, Valentine began looking forward to going home and decided that she wouldn’t rely on a cane or walker. Within weeks, her ability to move increased dramatically. In less than a month, she was able to climb stairs without help. The medical staff told her they were amazed by her progress. “I’m amazed at myself,” she told them. Valentine's recovery from surgery, while impressive, was just the first part of her battle. This somewhat rare type of tumor, which represents about 4 percent of all primary brain tumors, requires both radiation and chemotherapy. She already has begun radiation therapy at the UCI Health Chao Family Comprehensive Cancer Center, where she is receiving treatment with a linear accelerator, which can deliver a powerful dose of radiation targeted to within a millimeter of the tumor site. Next she’ll undergo a chemotherapy regimen at the cancer center. Carrillo, the neuro-oncologist, says that with aggressive treatment, her prognosis is quite good. 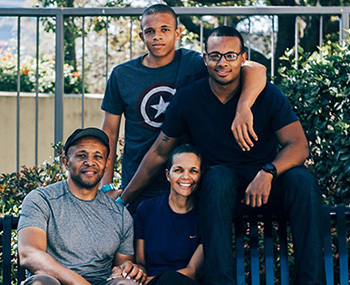 Valentine credits her faith and her supportive family — husband Fred and their sons, Daniel, 17, and Chris, 22 — for keeping her going. “I have a positive attitude, and I’m not going to let this get me down,” she said.